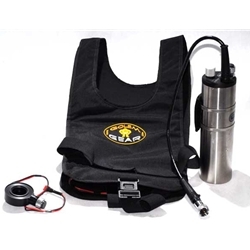 Q-Vest, drysuit heating system with E/O connectors. The bulkhead connector block is a screw-in part that replaces the drysuit inflator valve. There is no need to cut another hole in the drysuit when installing the Q-Vest. 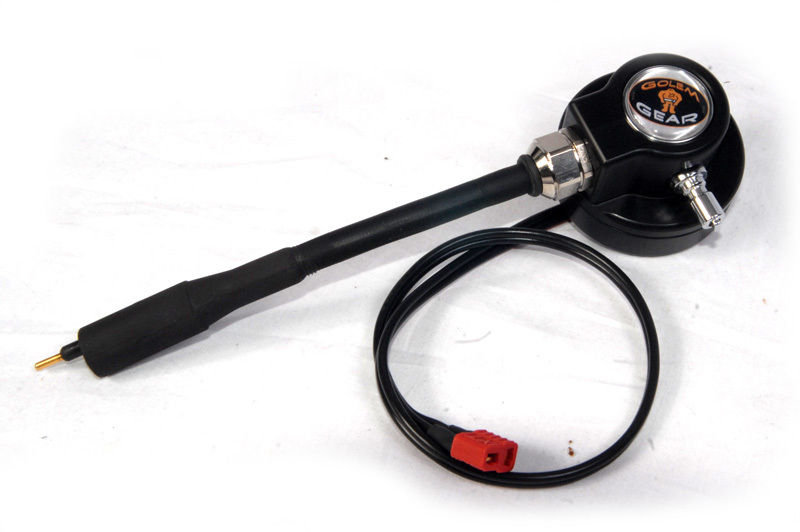 It is fitted with 4 inches (10cm) of cable terminated with standard E/O connector for easy integration into your diving system. The stainless Steel battery canister has rotary switch and charging port. It is designed to mount on diver’s waist belt on the left or right side with screw-in wet plug cable comfortably reaching the socket on the bulkhead connector block. The rotary switch on the battery canister allows diver to set three levels of heat output as well as to completely switch the heat off. The Q-Vest is powered by 12V 10Ah NiMH battery providing several hours of comfortable heat output. The water-proof case is made of high-quality stainless material. The battery pack is provided with a 30cm cable terminated with a EO connector which can be also disconnected underwater. The cable is connected through the switch with an electronic regulation and is designed for connection with the electronic heating. The electronic regulation is designed for setting an optimum warm comfort and saves electrical energy at the same time. The battery packs are charged through the connector on the top plug. Unless you use a dive light connected to the battery pack when diving, the connector must be closed with a water-proof plug supplied with the battery pack (the charging connector is not connected through the electronic regulation). We recommend using a light with maximum output of 10W .